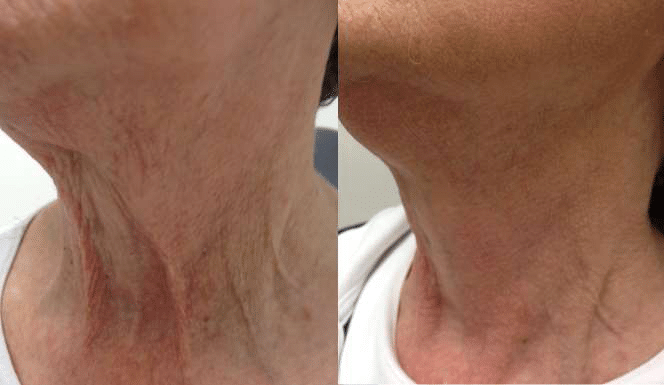 Now you may be able to achieve tighter skin on your neck, face, upper arms, and more without pain, without surgery, and with absolutely no downtime! The Solihull Medical Cosmetic Clinic is proud to be one of the first clinics to offer Fractora Forma in the Midlands: the latest in skin tightening using radiofrequency waves. This is a NEW EXCLUSIVE thermal skin tightening and rejuvenation treatment. What does Dr Sagoo say about “Fractora Forma” in the Midlands? How does “Fractora Forma” work? Fractora Forma Firm and Fractora Forma Plus technologies utilize radio-frequency (RF) energy to penetrate the skin layers to selectively heat the skin tissue and the deep dermis where the collagen fibres are embedded. The local heating may cause an immediate contraction of the collagen fibres, while at the same time it may increase the metabolism of the collagen producing cells (called fibroblasts) thereby accelerating the production of new collagen fibres. Radio-frequency may also diminish the size of fat cells, which can produce better contouring of the body. Fractora Forma Firm and Fractora Forma Plus offer you two configurations of non-invasive treatments for collagen remodelling. The “Firm” treatment is for the face and neck, while the “Plus” treatment treats the body. We offer both options for Fractora Forma in Solihull. What are the benefits of Fractora Forma? Fractora Forma (both Firm & Plus treatments) offer advanced fractional radio-frequency anti-aging treatments. Many Fractora Forma patients have reported that their skin feels smoother, with improvements in definition and decreased wrinkles. Fractora Forma is an advanced aesthetic solution for all skin colors. A typical treatment course consists of 6-8 sessions. Each session takes between 30-60 minutes depending on the area being treated. We recommend purchasing a package of 8 sessions for our patients getting Fractora Forma in the Midlands. Optional maintenance treatments are available to clients seeking prolonged, enhanced results. Am I a candidate for Fractora Forma? Fractora Forma Firm and Fractora Plus treatments are suitable for all skin types. However, the extent of the patients’ reaction to treatment is client specific. Candidates who maintain a healthy lifestyle and are near their ideal weight typically show the best results. What can be treated with Fractora Forma? The Fractora Forma treatments are virtually painless. During treatment some patients can experience mild heating sensations. Immediately after treatment, some redness and warmth can often be seen and felt on the skin. Both are necessary to the treatment and should disappear within an hour or so following the treatment. Most of our patients getting Fractora in Solihull tolerate the procedure very well. Fractora Forma may stimulate collagen to naturally remodel more tightly with more firmness, by gently heating the skin with radio frequency. Many describe the warmth of the current flows between the Fractora Forma radio frequency electrodes as comfortable. The Fractora Forma has a unique built-in temperature feedback system. This ensures that the perfect temperature for maximum treatment effectiveness is reached while nearly eliminating the risk of overheating. Immediate results may be seen in most patients during the first treatment. Noticeable reduction in fine lines and wrinkles and face and neck contouring and lifting are commonly seen over a full treatment course. Clients having Fractora have reported improved tone and texture of their arms, tummy, and thighs, and a lift in their buttocks. Fractora Forma treatments are an in-office procedure with no downtime. You can return to work or your daily routine immediately after your session. Fractora Forma can treat sagging skin on the entire face. You can use Fractora Forma to treat skin with decreased elasticity in areas like the forehead, crow’s feet, upper eyeids, lower eyelids, nasolabial folds, jowls, smile lines and neck. Treatment of the body can include the arms (bat wings), abdomen and other areas that may benefit from skin contraction. Our patients having Fractora Forma have reported improvements in all of these areas. It is generally recommended that at least 6 weekly sessions are performed over six weeks. Individuals with mild laxity may be treated in fewer sessions with more weeks between each treatment. Schedules should be based on a medical pre-evaluation. If you would like Fractora Forma in Solihull, you can arrange individual treatments or a package, whatever suits your needs the best. Can Fractora Forma be used in combination with other treatments? Yes, Fractora Forma can be used in combination with most other laser treatments, facials, injectables and/or fillers. We offer Fractora Forma in Solihull in combination with injectable filler and muscle relaxing injections, to create a treatment plan that we call the Fractora Face Lift. How much does Fractora Forma cost? The initial consultation is free. We recommend 8 treatment sessions at weekly intervals; a course of 8 costs £1600. 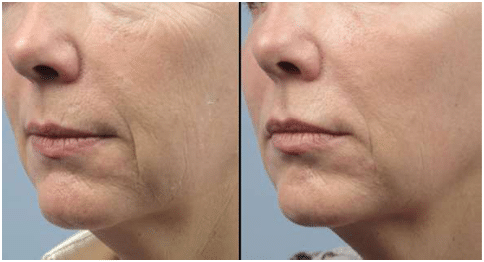 For those who would like the chance for even more improvement on the face, you can add injectable filler for mid face volume lift and muscle relaxing injections; the total price for this Fractora Face Lift is £2000. Fractora Forma is the most exciting, latest technology, which may offer non-surgical skin tightening. Book today for your FREE consultation on 0845 603 6150.